How amazing! You’re an inspiration to many, NASA Astronaut Christina Hammock Koch! We’re in for a beautiful weekend! Take a cruise up the beach with us - tours are running! For everyone who is worried about our hardy banker horses, here’s an excerpt from our friends at Corolla Wild Horse Fund’s Hurricane Florence post. To our local human friends, please be safe, be sheltered, be prepared. To our visitor friends, we hate that your vacation was ended abruptly but we thank you so much for sending your well wishes and good vibes to us during this monster storm. We can’t wait to be in the clear so y’all can get back down here. We’re in for a beautiful Labor Day weekend! Landlines and internet have been down for a few hours today - all Charter users along the entire Outer Banks are effected. We really appreciate your patience while we're working through this hiccup. PLEASE don't hesitate to swing by our little hut to book a tour. We're nestled in between the The Corolla Beer & Wine Garden and the Corolla Post Office/Winks Convenient Store. Come by! 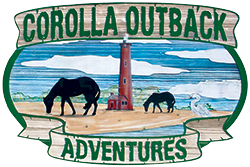 Grab a bite from @Corolla Pizza & Deli Inc.! Cool down with a cold one from the Beer Garden! Just a little guy taking a sunset stroll with his family! We are so thankful to be able to watch Castano thrive! He’s growing and he’s healthy - and how could he not be happy?! Incredible photo, Erin! Thanks for sharing!! A bit of Shark Week humor to brighten this dreary day! If you HAVE to drive, please be cautious. Go slow, don’t create a wake, and be safe! May we suggest Corolla Movie & Bistro? That’s a great place to be on a rainy day! Give us a call and book your seats - let’s get some fresh air! TURTLE BABIES! A new, protected nest is roped off in Carova and we couldn’t be happier! Major kudos to N.E.S.T. (Network for Endangered Sea Turtles) and all the amazing volunteers who keep these precious sites safe! Awesome well done to My Amazing BFFL who also volunteers educating the public of how they can help! And I am so proud to see this as well! Wonderful ! Love you Kim! We highly recommend the 6PM drive! Thanks for sharing, Stephanie! We love seeing pics from our guests! Zoom in on that gorgeous face!